Performance data is often the best detergent for cleaning up SDG-washing. The fact that many businesses are actively participating in the UN 2030 Agenda to achieve the Sustainable Development Goals (SDGs) is both exciting and essential. That said, there is a significant risk the SDGs could become little more than scaffolding for corporate branding and easy fodder for PR departments. Already, greenwashing has generated so much skepticism that there is even a Greenwashing Index. How do we prevent a new wave of “SDG-washing”? Performance data is often the best detergent for cleaning up SDG-washing. When companies make tangible commitments to the SDGs, and progress and outcomes can be tracked using objective metrics, there is an opportunity for external observers to evaluate the company’s actions and for company management to allocate resources and execute. If the SDGs are to be co-opted by a company’s branding department, we should have mechanisms to hold them accountable – with data on hand. As part of our Inclusion Inc. research initiative, we learned of alternative ways in which companies have committed to sustainable development and are applying data-driven approaches. Data can facilitate setting targets, tracking progress, celebrating successes or identifying gaps and additional work to be done. That said, data can also be a double-edged sword: the safest route to a successful outcome is to focus on a narrowly defined project with clear evidence of shared value. However, if a company aims for a broader swathe of challenges, with explicit quantitative targets, it runs the risk of missing some. The latter outcome could create public relations challenges. Development issues are complex and multi-dimensional and value may not always be “shared”, at least in the near-term. As a result, data-driven commitments run the risk of creating a perverse incentive of managers choosing problems where success can be demonstrated and avoiding the more difficult and systemic ones. As illustration of this paradox and the corresponding management conundrum, consider two examples. The most direct approach to data-driven management is to organise a project with well-defined, bounded objectives and an intervention with a measurable impact. Consider the example of Southwest Airlines and its Evolve project. One of the key elements of the project was fuel efficiency, which combined two issues simultaneously: for Southwest, fuel is one of the primary drivers of cost (pdf) and has the largest environmental impact. Therefore, reducing fuel consumption delivers shared value: it saves money for the airline and reduces emissions, thereby advancing SDG13. When Southwest replaced seat covers and other interior elements with lighter-weight, more environmentally friendly materials, it reduced the weight of each aircraft by more than 600lbs, saving fuel and reducing emissions. These outcomes had objective measures which made the impact of the project comprehensible to managers, external stakeholders and observers. In fact, Southwest took its environmental responsibility even further. Through a second programme called LUVSeat: Repurpose with Purpose, Southwest found ways to re-use the 43 acres of used leather into new products for local communities. With sharply focused objectives and measurable outcomes, Southwest gave managers the opportunity to track progress and celebrate success, while creating shared value. As an alternative to focused projects, consider Diageo’s initiatives that take a broader, more systemic approach to sustainable development challenges. 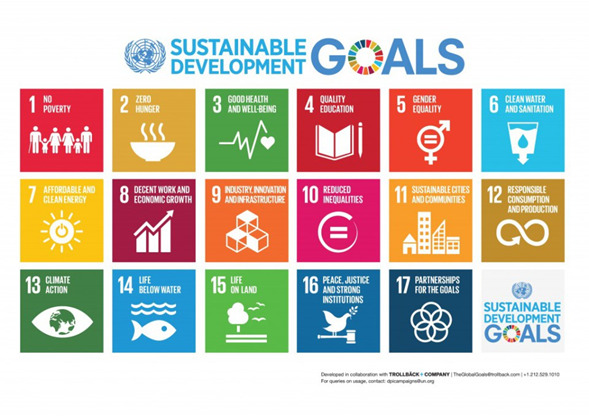 Diageo is among a small group of companies that got a jumpstart on the SDGs by establishing their own goals in anticipation. Its 2020 Sustainability and Responsibility targets are more selective and specific than the SDGs and are based on the issues that the company considers to be the most material, that build on past performance and align with one or more of the SDGs. Diageo has chosen three broad areas as its focus: alcohol responsibility, community development, and environmental performance. Each programme emphasises tracking progress. For example, by 2020, the company aims to reach a million adults with training materials that will enable them to champion responsible drinking, source 80% of its agricultural raw materials locally in Africa, and achieve a 50% improvement in water use efficiency. The programmes are designed to be holistic to ensure broad impact. The environmental performance programme alone involves many complementary targets: returning 100% of wastewater from operations to the environment safely, reducing emissions from direct operations by 50%, including achieving a 30% reduction along the total supply chain, reducing total packaging by 15%, while increasing recycled content to 45% and making 100% of packaging recyclable. Such systematic criteria-setting makes a company’s progress – or lack thereof – auditable. It allows managers to track performance against their stated goals and make adjustments. It facilitates a data-driven conversation and a diagnosis of what is or is not working. It also allows external observers to gauge how closely the company is adhering to its public commitments. It makes the company’s engagement with the SDGs deeper by facilitating investments in complementary initiatives. While Diageo’s is a more integrative approach to sustainable development, it also exposes the company to the risk that, with multiple quantitative targets, there are more chances to fall short. Across multiple operations there are tradeoffs to be made when sustainable and inclusive business investments are incompatible with core business imperatives, at least in the near-term. In many situations, company operations or corporate strategy imperatives must override the timelines set out by sustainable development targets. As Diageo’s own assessments of its past progress suggest, the realities of operating have caused the company to miss its targets, six of them in environmental performance, despite making substantial progress on all. In some situations, company operations simply cannot be modified within the timeframes originally set out. In other cases, strategic opportunities arise that must be acted on. For example, Diageo acquired United Spirits in India with the knowledge that it would compromise its ability to achieve the 50% water reduction target. The acquisition was a critical opportunity for Diageo to gain advantage in a market that is almost a 10th of its global sales and potentially 25% of its growth. What should a company do? Well-executed projects such as Southwest’s Evolve, should be pursued. However, my suggestion would be to push even further – take a holistic view of the sustainable development objective with its many inter-connected problems, focus on issues that are “material” – creating shared value in the longer-term - and be prepared to handle operational complexity. The company must also be prepared to make its progress record transparent and manage the public relations risk of missing targets. Data serves many purposes: it promotes transparency and helps clean up SDG-washing. The realities of business are such that tradeoffs will have to be made, and data helps with that too. The double-edged sword of data should not scare companies off from considering holistic commitments. They should strive for system-wide impact in focused programmatic areas, even if it takes more time than planned. Data is also the best way to have an honest dialogue on how businesses can realistically commit to the SDGs. The messy intersection of business needs, societal needs and far-sighted management is preferable to the warm glow of an impact-free public relations website. Bhaskar Chakravorti is the senior associate dean of international business and finance at The Fletcher School, Tufts University. He is also the founding executive director of Fletcher’s Institute for Business in the Global Context and author of The Slow Pace of Fast Change. The research reported here was supported by Citi Foundation.